Northwest Arkansas ALIVE | Penguin Ed’s Bar-B-Que (Season 04, Episode 04) from Northwest Arkansas ALIVE on Vimeo. Penguin Ed’s BBQ has served the community for 25 years, with 3 Fayetteville locations and catering throughout Northwest Arkansas. For over 20 years and counting, Penguin Ed’s Bar-B-Que has satisfied and impressed thousands of customers. Over the years, we’ve received several awards for our barbeque, and we appreciate the recognition. But for us, we judge success by the number of customers who leave satisfied and come back in to eat with us time after time. Part of what makes Ed’s great is the slow, hickory-enhanced method for smoking meats. Another part of our recipe is who we are: a family. In fact, we have several employees who have been with us for almost the entire journey. Because we have so many longtime employees, you can rest assured that the high quality of our food will remain unchanged from day to day. When we started this venture in 1993, we didn’t have a building to speak of. We just served barbeque under a big borrowed tent on a patch of scorched earth near Hwy 265 and Hwy 45. It was a bare bones operation – no telephone, no ventilation, no pesky cash register. Just us, the tent and the heat. As summer approached, we upgraded our operation to a trailer, and it served as our center of operations for three years. That little white trailer with the red lettering had its quirks. For one thing, it was tiny; two of us could not stand side-by-side at its width. To this day, some of us who toughed it out in the trailer still walk sideways at work, because that’s how we learned to avoid spills and near-misses in the trailer. For another, the trailer retained heat all too well. In the summers, we estimate that the inside of the trailer was approximately 100-degrees hotter than the outside temperature, give or take. Somewhere in the midst of all the heat and sweat of the trailer, the Pilgrim of all Penguins, Ed Knight, decided that he was going to create a fleet of emperor penguins out of paper-mâché. Whether it was too much heat or too much Discovery Channel, we’ll never know. We do know that the penguin thing took off in a way none of us could have ever expected. Once Ed started his fleet, he would display them around the trailer. Some days they would be by the picnic tables, sometimes they would stand on the roof. Even now, if you come into our Mission location, you will see Ed’s original paper-mâché penguins on display. Kind people from all over started giving Ed penguins, and the collection grew. We can now claim one of the two largest penguin collections in the country. Originally, Ed had named his barbeque operation “Crossroads BBQ,” but amidst all the penguins, Ed’s burgeoning nickname “Penguin Ed” stuck. 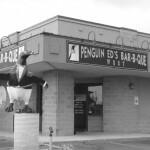 Finally, in July of 1996, we opened Penguin Ed’s Bar-B-Que at Hwy 45 and Hwy 265. That first restaurant was just the middle portion of the space we have now. After a few growing pains, and several racks of ribs later, we gained our footing and were able to expand for the first time in 1999. Then, after a few more racks of ribs, some smoked chicken salads and a dozen or so cookies, we expanded again in 2002, completing the Penguin Ed’s location that nests at the intersection of Mission and Crossover. Today, our first location, just a few paces from where the tent once stood, has grown to be over twice its original size. Breakfast at Mission – On July 9th, 2010 we started to serve breakfast at our Mission location. We feature locally roasted Airship coffee and a wide variety of pastry items. All of our baked goods are homemade from scratch and baked daily in our own kitchen. We offer a full breakfast menu along with our baked goods on Saturdays & Sundays 7am-11am. In 1998, the Basset family, who owned and operated B&B was ready to get out of the restaurant business, but they didn’t want to see a Fayetteville landmark disappear. That’s where Ed came in. In a friendly purchase between owners, B&B on South East Street, near the Square, became our second location. Ed was intent on holding true to what put B&B on the map. So, while we’ve added some of our own touches, we’ve kept B&B’s signature details – the wooden booths, the orange phones for placing orders, and of course, the fried pickles. 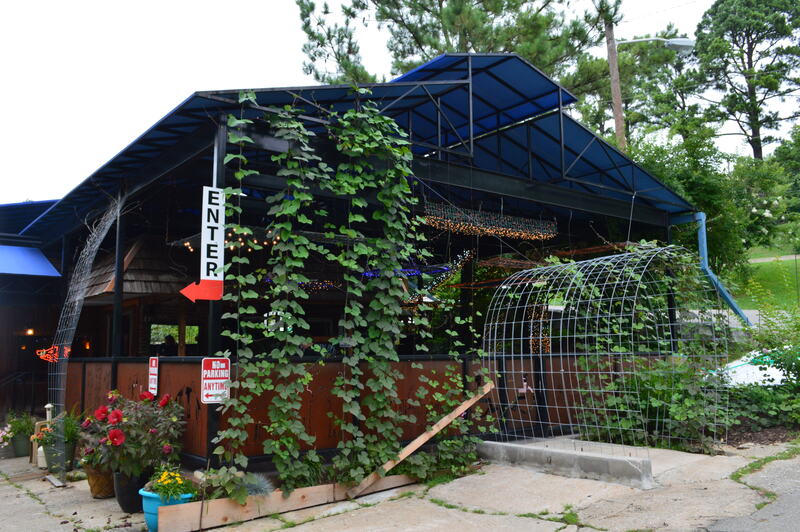 In 2015 an outdoor patio was added so customers can enjoy the outdoor ambiance of our wooded, mid-city location. Once we were settled in our first two locations, we were up for a new adventure. For some time, Ed looked for a location that would serve the western part of the city. 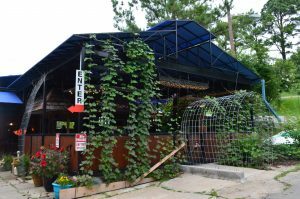 As the population grew, especially near Double Springs Road, Ed saw an opportunity to be one of the first restaurants to serve the budding community. Twenty-five days before opening, our mascot Oreo left our Mission location, and each day, in “the March of the Penguin,” Oreo was a little closer to the new location. On April 17, 2007 Penguin Ed’s officially migrated west and opened its third location at 6347 W Wedington. We had gotten our webbed feet wet with the other two stores, so for this restaurant, we were willing to dive right in. Ed and Liz Knight designed the new building with a curved countertop and a special party room. We even have a ceramic tile portrait of a penguin that greets you when you walk through the door. After working for 10 years as District Manager, Bob Grant became a partner with Ed and Diane as an owner of Penguin Ed’s in 2017. Ed and Bob have been friends for over 40 years, and it’s truly amazing to see this friendship blossom into a workable, formal business relationship. Bob brings a wealth of customer service experience and people friendly skills to Penguin Ed’s. We’ve come a long way since those days sweating it out in the trailer. We couldn’t have done it without the hard work from our employees, a cast of characters who have been intrepid and fortifying.